January 9, 2013 by © Joan Miller - Luxegen Genealogy. As you all know, my mother (and creator/maintainer of this blog) has passed away after a lengthy battle with cancer. I will continue to manage and maintain this blog for as long as I can. Thanks to everyone for their kind words and thoughts. Barbara “Joan” Miller (nee Kerr) passed peacefully on January 4th, 2013, in Calgary surrounded by her family after a courageous journey with stomach cancer. Born March 7, 1953 in Watrous, Saskatchewan. Predeceased by her grandparents William (Bill) Irvine and Isabel (Woodland) Irvine and Homer and Elizabeth (Wilson) Kerr, father Edward John Kerr in 1983. Joan is survived by her mother Elizabeth (Betty) I Kerr (Irvine) of Calgary, by her best friend and loving husband of 37 years, Reg W Miller, son Kevin Miller (Dorlisa Lam) of Calgary, daughter Heather Miller of Calgary, siblings, William (Bill) Kerr (Pam and daughter Yasmine) of Calgary, Ellen (Kerr) McClughan (Neil and son Scott) of Regina, Mother-in-law Yvonne E. Miller (nee Aumack) of Trail, BC, brother-in-law Gordon Miller (Kathy Hudspith and daughters Jessica and Kariann) of Victoria, BC,, brother-in-law Hugh Miller (Gail Gabana and children Andrea, Nicholas, and Joseph) of Trail, BC, as well as numerous aunts, uncles and cousins. Joan grew up on the PFRA pasture at Hatfield near Nokomis, Saskatchewan. The eldest of 3 children, Joan started school in a one room school in Hatfield and then went on to finish Grade 12 in Nokomis. Childhood activities included Girl Guides, swimming lessons, helping with “round up” and the many visits from cousins. Joan continued her education in postsecondary in Saskatoon obtaining her Diploma in Biological Sciences. Joan briefly worked at SaskTel for a summer position where she met soulmate. She married Reg in the Nokomis United Church on July 5, 1975 and they lived in Calgary where their 2 children, Kevin and Heather were born. Joan worked at the University of Calgary for 34 years as Technologist and Lab Manager – Medical Research labs, retiring in the fall of 2009. Joan was a genetic genealogist who used DNA technology and social media to complement traditional genealogy research. This included Y-DNA project administrator and coordinator for the Alberta Family Histories Society (AFHS) DNA Special Interest Group. 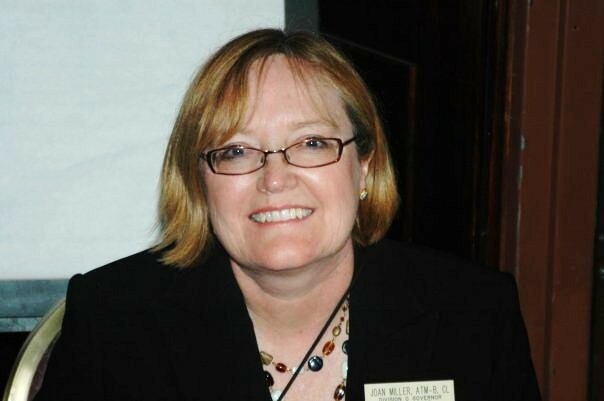 She was a member of the Genealogical Speakers Guild, the International Society of Genetic Genealogists and various other genealogy societies. Joan wrote a regular column for the Alberta Family History Society and served on the Public Relations committee. 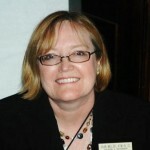 She also created the Luxegen Genealogy Blog which was named in Family Tree Magazine’s Top 40 Blogs of 2011. She served as an Official Blogger for Rootstech 2011. Joan inherited the genealogy gene from her maternal grandmother Isabel Irvine who was a family historian and great story teller. Her grandfather Bill Irvine kept a diary for 60 years! It was inevitable that one of the grandchildren would be interested in pursuing their genealogy roots and that was Joan. Joan also was very active with volunteering in Toastmaster International where she worked her way through the various levels receiving her Distinguished Toastmaster Designation in January 2012. Joan loved the diversity of cultures and enriched her life through travels to many countries. Joan led an active life filled with activities such as soccer, skiing, qigong and hiking. She will be missed by all whose lives she touched. The family would like to greatly thank the staff at Tom Baker Cancer Centre. They would also like to acknowledge the incredible care and compassion they showed on her passing. Finally they would like to thank Dr. Easaw, Dr. Wiens and Colleen Cathbert for all their care and efforts in this journey. In lieu of flowers, donations can be made to the Kiva – Genealogist for Families project – empower people around the world at http://www.kiva.org/team/genealogists. Your mom was truly an amazing women and I’ve loved her blog for years now. She was strong and fought the good fight with so much positivity. She is very loved. She would be so happy and proud that you are wiling to take up the pursuit of her blog. Please let us know if there is anything the genealogical community can do – many have already donated to Kiva but if you or your family needs anything, we’re here. Prayers and Blessings to you. Your mother was a warm, kind and generous genealogist who shared her wisdom with the entire research community. We will miss her so very much and hope that knowing how many lives she touched will comfort you in your loss. Lovely obituary for a lovely lady. Sorry to learn of her passing, but we know she will be busy in heaven finding all the answers to her brick wall questions. Renee Zamora´s last [type] ..Mark Your Calendars – UVTAGG Meeting! I am so sorry for your and your family’s loss, Kevin. Not only has your family lost a wife, mother, daughter, sister, but the genealogy community has lost a wonderful member. Blessings to you and your family.